Scribbles from a midnight diary: Pee-Wee Herman Show!! Last night I had the pleasure of seeing Pee-Wee Herman back in his saddle. If you know anything about the show, Cowboy Curtis is the one in the saddle. But I digress. 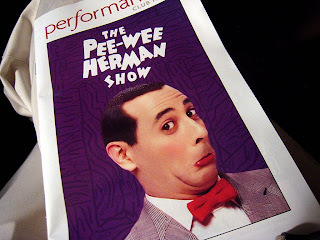 A client bought tickets for myself and my coworker to go see Pee-Wee's show down at Club Nokia, located in downtown Los Angeles. Apparently, Paul Rubens is trying to drum up publicity to make another movie and he wanted to see how much love he could get from a stage show. From the number of people that bought tickets for his month long run, it is quite clear that the love is quite strong. It was like going back in a time warp. The stage was brilliantly set with all the puppets that made his show such a hit back in the 80s. If I had been more of a fan, I would be able to name all the puppets but honestly, I was a little old to be watching Pee-Wee back in the day. I had to catch him in reruns and in his movies and I never became a die-hard Pee-Wee Hermanite. I admired his dorky boyish charm but I never found it all that funny. After watching the show live, my opinion has not changed. In fact, I thought it was cute and quirky and entertaining but I didn't looooooove the show so much, I wanted to marry it. If the truth be told, I found Pee-Wee a little tired. His youthful enthusiasm has disappeared or maybe it was left back in the 80s. I suppose that is to be expected since Paul Rubens is now pushing 60. Everyone has to grow up, even Pee-Wee. The other original cast member isn't faring so well either. Miss Yvonne is no longer the chirpy spring chicken she used to be and at her age, she is a little (no, a lot) too old for the new Cowboy Curtis. But the show never lagged and criticizing the show is just well, mean. Like Francis after stealing Pee-Wee's bike. So let's just say, it put a smile on my face and these days, that's pretty damn good. Thanks to my client who did the voice of Chairry, we were taken into a Q&A with Paul Rubens after the show. I found it very entertaining. Paul was very honest about his struggles and when he thanked everyone for all the love, he sounded sweet and genuine. Because I saw some of the real man behind the mask, it has made me into a fan and I hope he gets what he wishes for, even if Jambi won't grant it. Ahhh Pee-Wee, at least Chairry thinks you're cute!